"Any job big or small, do it right or not at all"
Born in a small, Southern California, blue-collar beach town, graced with world class point breaks and seaside racetracks, where ghosts of a once towering oil industry still linger in the shadows. Iron & Resin is the brainchild of several friends who, after decades of collective experience building successful clothing brands, decided to turn back the clock and start anew. The result is a small, hand built collection of goods that draws heavily upon the founder’s own lifestyles and experiences. Forged in California...In a mass produced, disposable world, Iron & Resin is a product of "one-off" culture. Where men still build, by their own hands, the craft they ride, be it water or land. Spoken Moto seeks to become the hub of motorcycle culture in Central Oregon. 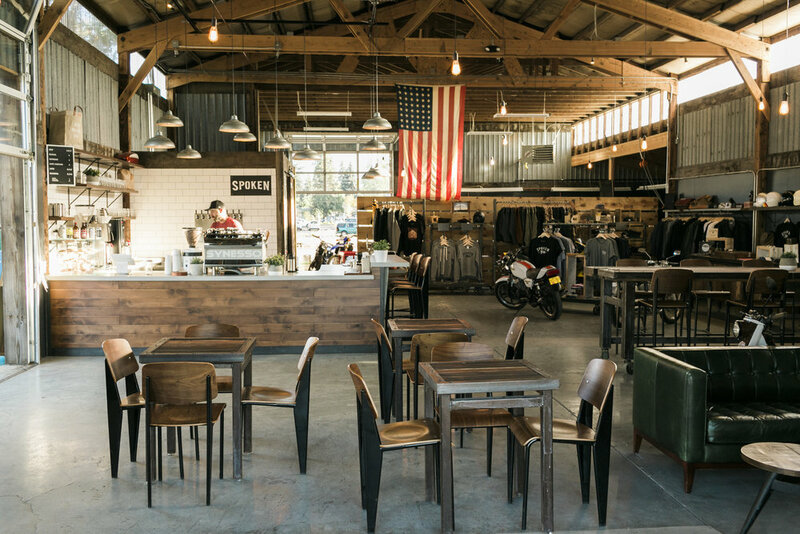 By providing a unique space at “The Pine Shed” for the moto-curious to gather, Spoken will create a new riding culture in Bend based on community, innovation, and creativity. Whether it’s getting together for a coffee, grabbing a beer, or picking up a new jacket, we want everyone who visits Spoken Moto to feel inspired. By creating a riding culture out of the Pine Shed's unique space with like-minded people in Central Oregon we hope to gain influence that may affect the bike and creative community. Our aim is to give encouragement and inspiration to all who come in contact with the Spoken Moto brand. Restoring what was forgotten and bringing new life, beauty and purpose. Wedding-averaging around 27-30 wedding each summer. WG is a creative fun brand I created around hand made skateboards and vintage custom motorcycles. It was been a great side project that has help me connect and build relationships in the moto,makers, and surf skateboard industry. In 2014 our bike won a convited award from the "One Moto" Show in Portland Oregon.